Over on the MIT Technology Review, Nick Bostrom writes about the Great Filter (hat tip to Hit & Run). The Great Filter is one side of possibly the most important question for humanity. The problem is that some of us are violent creatures who want to cause mass destruction. And some of us are short-sighted creatures who do so by mistake. The means of causing mass destruction always get easier, never more difficult. The amount of mass destruction we know how to create always grows. Presumably, we don’t want this to happen, but how to stop it? Prohibition laws don’t work. Whether it’s marijuana or nuclear weapons or a deadly supervirus, anyone with the wherewithal to acquire it and the desire to acquire it can and probably will acquire it. For nuclear and other population-destroying weapons, the wherewithal barrier is still fairly high. But it gets smaller every year. Someday it will be easy for terrorists to acquire nuclear weapons; soon afterwards it will be easy for other criminals to acquire them. At some point it will be easy for any depressed individual on your block to get or make something or buy something that will destroy millions or billions of people. Laws have failure rates. Usually fairly large ones or, catch-22, they wouldn’t need to be laws. Unless the failure rate is under one in ten billion, they don’t matter to the Great Filter. Because, like the Internet, with these kinds of technology, it only takes one person to get past the laws and destroy humanity. Laws will not stop them. 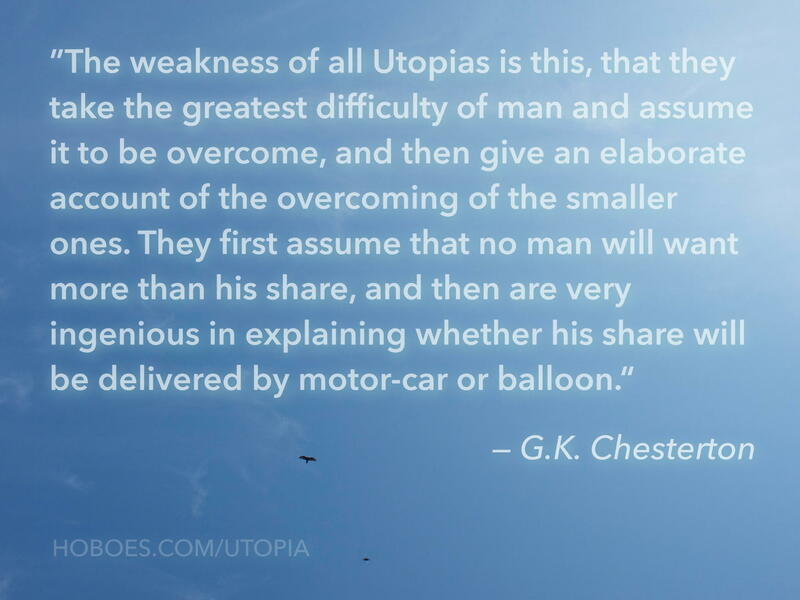 We need to make sure that by the time the wherewithal barrier gets that low, the desire barrier has risen to the point that nobody wants to breach it. We need to ensure that nobody wants to use these kinds of destructive technologies, and we need to do so before it becomes so easy to make them that anybody who wants them can have them. I’m not sure how you would design a cover to play more to the narcissism of showboat killers. This is a near-perfect example of how difficult it is to stop incentivizing showboat killers. This is why they plan and perform their over-the-top crimes: because it works. 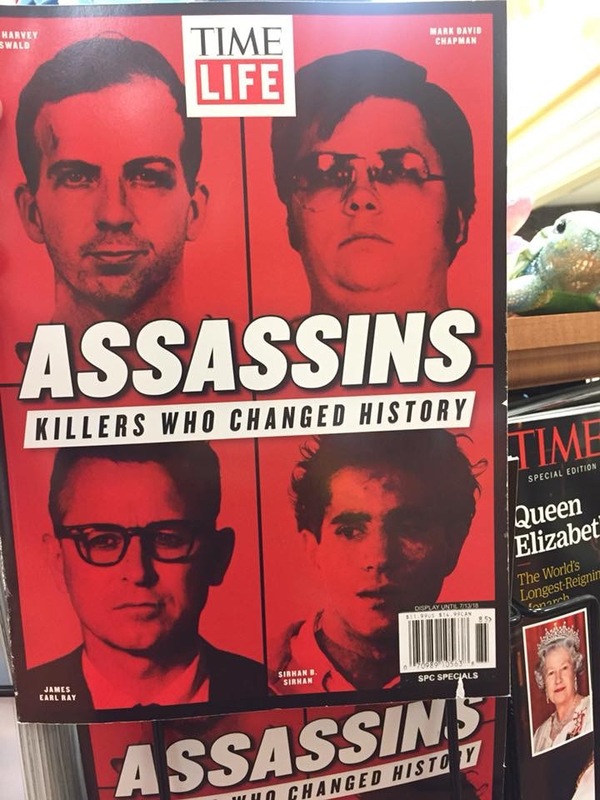 There are a handful of people right now, thinking about this Time-Life cover, seriously planning out how to top one of the pictured assassins, to get their face and name on the cover of the next special to succumb to the showboat killers’ gambit. As I wrote earlier, inciting killers in this manner shouldn’t be illegal. It ought to be beyond the boundaries of what any sane editor would publish. Much of our problems today are not something that better laws can fix; they require more introspection on the part of the media and politicians. It’s another example of how the Topper mentality (to steal from Dilbert) absent any sense of responsibility is not just indirectly dangerous to the public discourse, but also directly dangerous. Time-Life didn’t put out this cover and special because it’s in the public interest; they designed it specifically to be more edgy, more offensive, to break more boundaries than their past offerings. This special did not need to be presented this way to report news nor to explain history, not even news or history on this topic—they could, after all, have focused on the results rather than on the perpetrators. They wrote this special and led with this cover for the same reason showboat killers keep trying to top each other: they did it to become news. 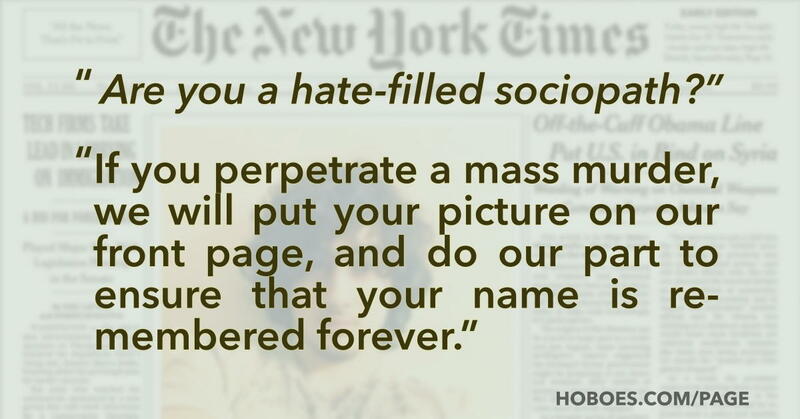 The only thing worse than being talked about for having incited a showboat killer is not being talked about at all. And of course it works, because unlike showboat killings, there’s no way to talk about how this cover works to create more showboat killings without talking about the cover itself. The egregiousness of this cover can’t be explained in words as well as it can be seen, in its blood-red cover and glamorizing head shots. It seems designed specifically to play to the narcissism of potential showboat killers. There’s a lot of argument, and has been for decades, about whether or not violent media incites violence. But there’s no question that showboat media incites showboat violence. What we’re going to do about it, I have no idea. I’m not going to buy this issue. But there are enough people fascinated by showboat killers—look at the reaction to the Boston bombers (who also got a cover, on Rolling Stone)—that this issue will sell. If we’re going to stop showboat killings, we have to find some way to break this most vicious of cycles. Most of the gun laws continually recycled after a mass shooting require the insane belief that criminals would suddenly start obeying this law, even though they’re willing to commit mass murder. They make no sense. If anything, such laws would increase the numbers of mass murders by creating more areas where only criminals are allowed to carry firearms. Such laws would tear at the self-defense rights of the law-abiding, and do nothing to protect them. Even the people who propose these gun bans eventually admit, if you press them, that their proposals wouldn’t have stopped the mass murder they’re using as justification. But what if there were a civil right we could infringe on that would stop such mass murderers? What if there were a law we could force the law-abiding to follow that would mean no more Parklands? It does exist. Psychologists and commentators across the political spectrum recognize that these particular kinds of mass murders are done because the killer wants recognition. They know they’re going to get media attention, and lots of it, if they (a) use a gun, and (b) kill lots of people. That’s why the vast majority of these killings take place in places where only criminals are allowed to carry firearms, even though such places are a tiny minority of places where people gather in the United States. Because the killers don’t want to be stopped before they kill enough people to make the news, and they know that if they’re stopped because one of their potential victims has a self-defense weapon, they either won’t make the news or their fame will be brief. Columbine was meant to be spectacular, and it has beckoned mass shooters ever since as an example, a template, and a challenge. They study it, and they try to top it in terms of either body count or showmanship. From suicidal ideation grows the delusion of grandeur; from the desire to kill yourself grows the desire to kill as many people as possible, with immortality on the line. In many cases, the killers are explicitly trying to beat the body counts of previously-sensationalized killings. They know what sells. It seems inconceivable that he was allowed to legally buy the gun and that he was able to get access to the school. And it does seem inconceivable. We have a National Instant Criminal Background Check System specifically to stop exactly this kind of killer. The school had a deputy on campus specifically to keep this kind of killer off of school grounds. It seems even more inconceivable that Broward County had a program in place that specifically helped the killer bypass the NICS. In Florida, one of the nation’s largest school districts has overhauled its discipline policies with a single purpose in mind — to reduce the number of children going into the juvenile justice system. Civil rights and education activists say the policy can be a model for the nation. Under a new program adopted by the Broward County School District, non-violent misdemeanors—even those that involve alcohol, marijuana or drug paraphernalia—will now be handled by the schools instead of the police. The problem with this is that, of course, if the local police don’t know about it—or, more likely, know about it but let the school deal with it—other police in other locales can’t know about it; and since the crimes are never prosecuted, they are never entered into the NICS. The other problem is system creep. It seemed to rapidly evolve to keep even violent crimes hidden, to the point that the deputy on campus apparently not only didn’t stop the killer but refused to share information that would have put the killer in the NICS. 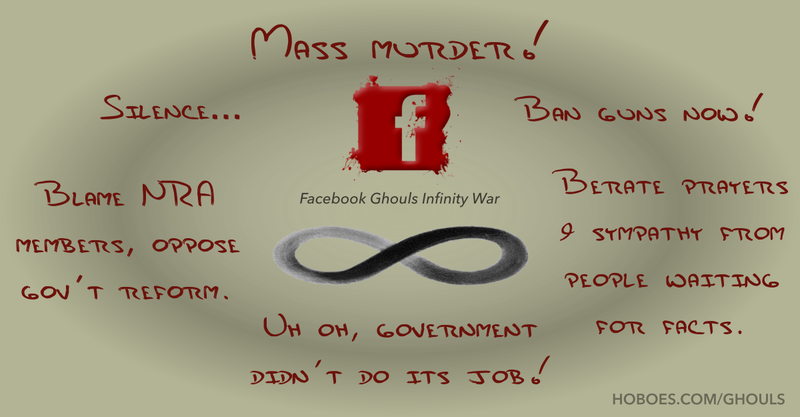 It’s as if the Facebook ghouls are praying for mass murder. But of course, everyone doesn’t forget. After the facts come out, it turns out that there are real solutions that would have solved these crimes, but those solutions aren’t gun control so it’s only the Facebook ghouls who forget—or, worse, blame the people trying to pass real solutions. There’s a mass murder in an area where only criminals are allowed to carry firearms. Before they could possibly know what actually happened, an army of Facebook ghouls calls for disarming the people who didn’t do it, and blaming NRA members.2 They try to capitalize on mass murders so rapidly that they will call for more gun bans even when the murders weren’t committed with guns. Other people wait for the facts to come in, and offer prayers and sympathy to those hurt by the murderer. The Facebook ghouls berate them both for waiting for the facts and for offering prayers and sympathy. When the facts come in, it turns out the government wasn’t doing its job enforcing the laws we already have. More gun bans wouldn’t have made a difference when the government isn’t enforcing current laws. In some cases, when the facts come in it turns out that the gun bans the Facebook ghouls have been calling for would have disarmed the bystander who stopped the murderer’s killing spree. This is what happened in Sutherland Springs, when it turned out the federal government wasn’t doing its job—the killer should have been in the NICS. First, the left called for banning all guns3 and then they went silent when it turned out the real solution was to make the federal government do its job—and especially that the laws they reflexively called for would have resulted in more murders in Sutherland Springs. This is what happened at the Pulse in Florida, when it turned out that the federal government wasn’t doing its job—the killer had been investigated by the FBI, who verified that he had threatened a mass shooting, and then they took him off of the list that would have notified law enforcement when he went to buy any firearm at all. This is what happened at Fort Hood in 2009, at Washington Navy Yard in 2013, and Fort Bragg last year. October 6, 2017: How do we keep this from happening again? Imagine this: you’re a police chief or an FBI district chief, and you get a notice from the automated warning system: a man who has twice been investigated because he threatened a terrorist attack has just bought a couple of firearms. Do you investigate? Of course you do. And when you investigate, you find out that he also tried to buy body armor. There is no question that you will act immediately to stop this terrorist attack before it happens. This is the way that the Pulse nightclub attack should have been stopped. In the immediate aftermath, the left tried to turn the attack into a call for more gun control, but when the facts came out it turned out the terrorist would not have been affected by more gun control. He didn’t want to commit a gun crime. He wanted to kill people at a gay bar. But also when the facts came out, we discovered that law enforcement should have been warned about him ahead of time. The terrorist had twice been investigated for threatening terrorism. The investigation came up inconclusive, with, according to the authorities, not enough evidence to put him in jail or even put him on the no-fly list. But it certainly seemed that there was enough to keep him on the lesser watch list that notifies law enforcement whenever there’s further suspicious activity. Unfortunately, he was removed from that list.1 So law enforcement was never notified. Conservatives suggested fixing that; the NRA suggested fixing that; the people who had been calling for more gun control moved on to something else. If this has been fixed, I’m unaware of it; FBI Director Comey publicly stated that he didn’t think anything needed to be fixed, once it came out that it was the FBI that had removed the terrorist from the notification list. The same is true of the Charleston church murderer last December. The law already should have kept him from buying his gun and should have notified law enforcement that he tried, because he had a previous felony narcotics charge against him. But laws to keep people with a record from buying guns don’t work if the records themselves aren’t appropriately handled. There was an obvious fix that would have stopped that shooting, and it did not involve new gun bans. But, again, if it’s been implemented, I’m not aware of it, although at least this time Comey didn’t act as though they’d done nothing wrong. Her children will never speak against tyranny in Iran. The significance of the graphs of destruction is that they empower individuals and small groups to cause mass destruction. Only one line on that graph is subject to alteration. The march of progress in medicine, biology, technology, physics, chemistry, and mathematics ensures that the technological line will always move down—it will always be getting easier for individuals to cause mayhem. Even improvements in our ability to travel quickly also improve the ability of people who want to kill to move to where they want to kill. Our only hope is that people—our euphemistic “non-state actors”—don’t want to use new and easier technology for destruction when it becomes available. We have, for the last eight years at least, been going about it wrong, 180 degrees from what we should be doing to affect the graph’s line of desire. It isn’t Iran that we have to worry about in the long run. It’s Iranians. Not Syria, but Syrians. Not China, but the Chinese. If we want to affect that line positively, we need to support the Green Revolutions, not their oppressors. The librarians of Cuba, not the Castros. The people of Iraq who voted Maliki out, and not Maliki. The people of impoverished countries and not their corrupt governments. It is the children of the Green movement in Iran who will grow up abandoned by the United States who will cross the graphs of destruction. The children of Cubans who we threw to the Castros in favor of improving state relations. Almost every aspect of our top-down foreign policy is wrong, from charitable organizations that put charity in the hands of corrupt governments to diplomats who prefer appealing to dictators rather than to the people the dictators oppress. Two graphs converging: ability and desire. Over the last several days, an arsonist or group of arsonists has started thirty-nine fires in the Los Angeles area. “Whoever is doing this is really messing with people’s lives,” said Los Angeles Fire Capt. Jamie Moore. What’s surprising isn’t that it’s happened, it’s that it doesn’t happen more often. I am amazed every time I go driving just how orderly people act in public. Watch the people driving on the other side of the road. Any one of them—all it takes is one—could cause massive death and destruction simply by swerving a few feet to the left. Police are asking residents in the area to bring forward any surveillance video from their properties that might show suspicious activity. Residents are also being encouraged to follow the “see something, say something” motto and report suspicious behavior to authorities. The police shouldn’t have to ask. Unfortunately, we’ve created a culture, especially in the cities but spreading to rural areas as well, that believes keeping order is something best left to the police, that there is no reason to get involved. There is no way for the police to stop people who want to commit random acts of attempted murder like this before the attempt happens. Even the biggest police state can’t forbid or track all flammable materials. Cameras on every street corner still need people on every street corner to watch them; at best, computer heuristics could be reactive, making it easier to catch someone who has already started a fire, but even that assumes that the cameras themselves don’t become targets. 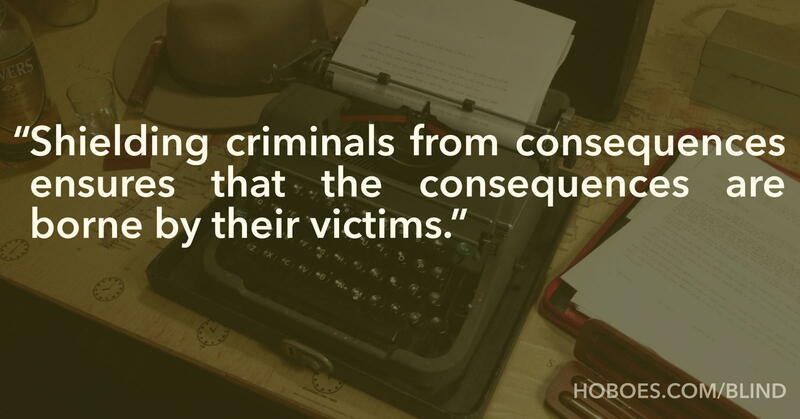 The only people who can stop a crime are people who are already there, either by stopping it or by immediately reporting it. Random killers commit their crimes because they can, and because they want to, and because the repercussions of criminality are lower than their desire to be criminals. We can’t take away their ability to start fires; technology passed that point centuries ago. What we can do is slow down the increased population whose desire to start fires—or commit other forms of mass murder—exceeds the social barriers in place against starting fires. This looks like a science fiction magazine from the fifties. Over on the Ace of Spades HQ, ArthurK mentions the technological singularity in passing as a way to talk about the social singularity on 9/11. He posts a newspaper front page from a month after 9/11 that would, to some pre-9/11 coma victim, look like a science fiction magazine. The technological singularity is, basically, technology that advances so rapidly that we can’t recognize what’s on the other side. The technological singularity intersects with Arthur’s social singularity. Every year it is easier to kill more people: every year it is easier to make more advanced and powerful things—including things that can be used for attacks that will kill millions. Imagine a graph along the years with two lines on it: “the resources necessary to kill millions” and “the resources of people who want to kill millions”. The lines haven’t normally crossed. The kind of person who wants to commit attacks of mass destruction doesn’t have much in the way of resources1. The problem is that the line for “resources necessary” is dropping. It will eventually drop below the “resources of” line, at which point we’re screwed, and bad. In some cases the line is already dangerously close. We have to watch it not just in areas like “resources necessary to build a nuclear weapon” or “resources necessary to create a supervirus” but also in areas we don’t even foresee as killing areas. It isn’t just that it’s easier to make nuclear weapons or biological weapons. The cheapness of computers made flight simulators cheap, which increased the availability of flight training. It became cheaper to learn to fly airliners, and class sizes became large enough that instructors didn’t necessarily know every student. 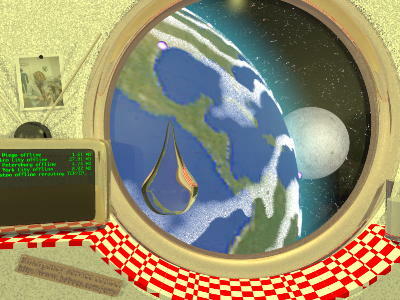 Homesickness, an image designed for the water-themed Internet Ray-Tracing Competition. The iPod--as part of the decentralization of media control--allows us to carve our own spaces, rather than having the “crass commercialization of public space” force us into marketing spaces of someone else’s design. To the ends of the earth last modified July 10th, 2018.